There is a lot of exciting stuff happening for our home in the past two weeks. In case you missed it..a tour of our home was featured on The Everygirl last week!! You can check out my interview where I share what it's like to renovate with a full time job and more about our home's decorating process: here. In other news, we finally got our permit for our renovation!!! Hallelujah. After a 4 month process we cannot wait to get started! Today is the day. Our screened-in porch roof comes off today. It's a big day. I am so thankful we decided to move out of our house and move all of our stuff into storage. I can only imagine what my stress level would be if things were still in our house when things like roofs are coming off. Pictures coming soon! In other news, I have been going back and forth on our kitchen layout trying to decide between if a range and standalone microwave or a stove-top and a microwave/oven combination are best for our space. Our new kitchen will not be huge so I want to be smart with our space striking the right balance between design and function. While I labor over that decision, there are so many other decisions to make that impact the functionality of our kitchen. The functionality is such an important piece for me because CT and I both love to cook. 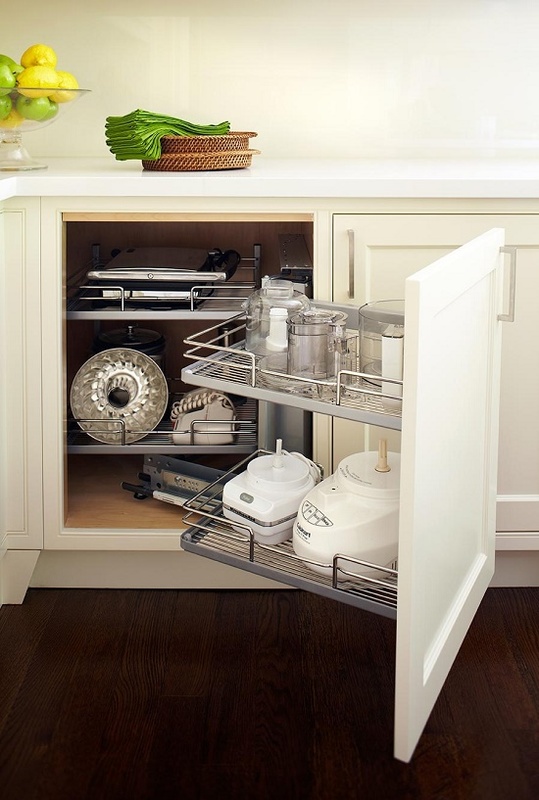 Thinking through the layout and function of each cabinet and drawer, I've pulled together 12 of the best ideas I've seen for functionality in a kitchen. 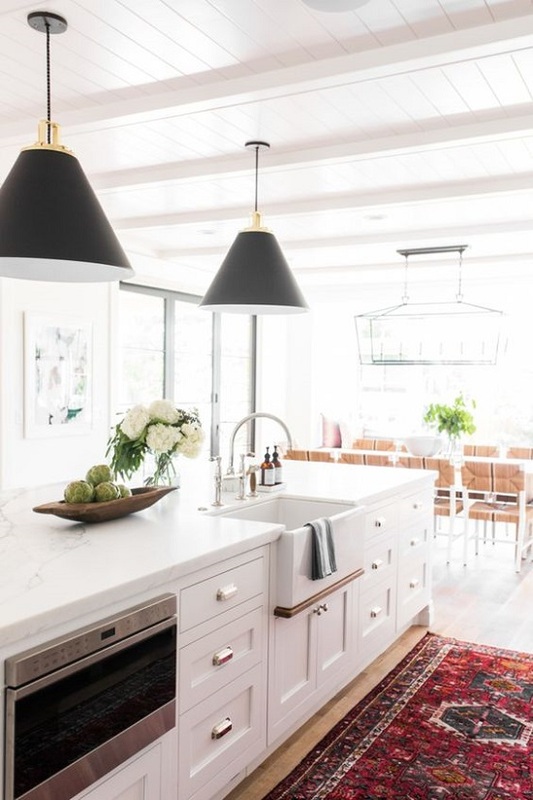 Have something you love about your kitchen functionality, share it in the comments! In our kitchen the island is going to be the main place for food preparation since it will be in the center of the room and right next to the stove. I'll plan to include an outlet to make using things like a Vitamix or food processor easy. I also love to have an outlet in the island for other electronics like your iPhone as the hub of the house. 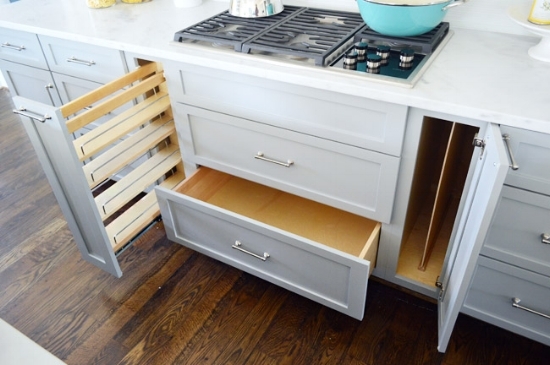 Whether you put pull out drawers next to your range or under a stove-top this is one of my must-have storage ideas for a kitchen. I'm not a big fan of pots and pan hangers and love when things have a very specific place so they can be stored away and out of view. 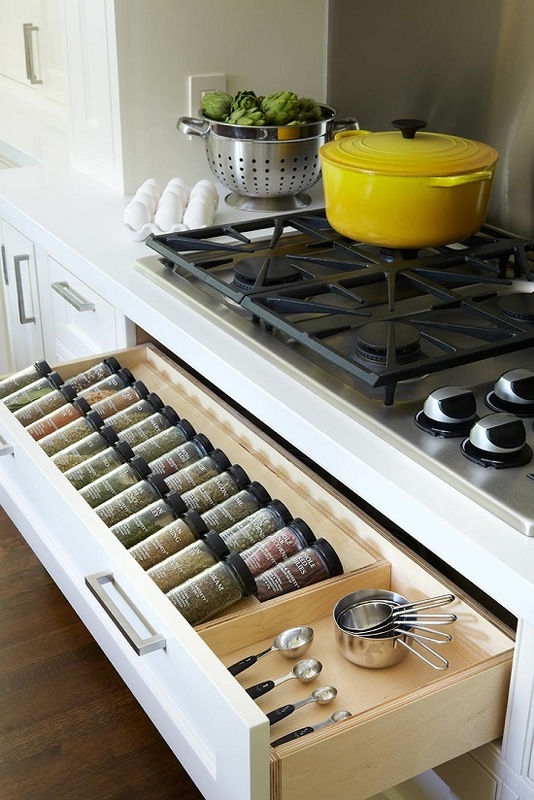 A custom shelve for spices is a great way to keep them organized. 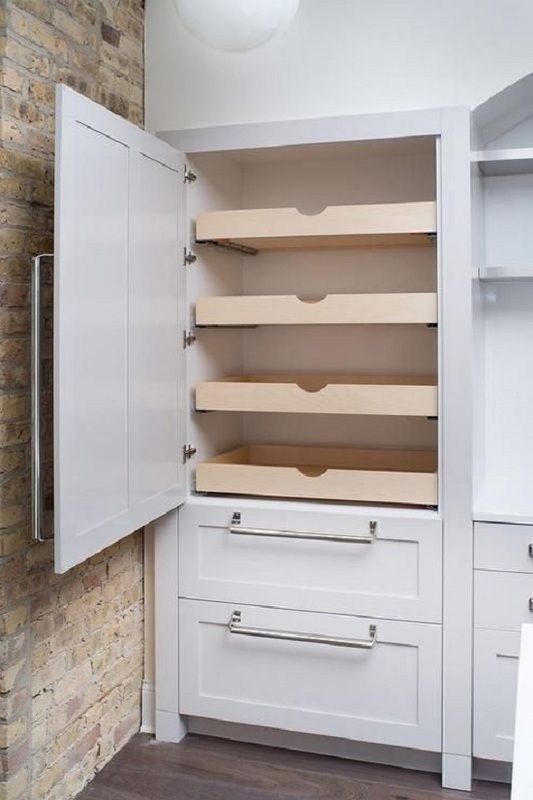 I like this idea of a narrow pull out where they can be stored but also like the in-shelf inserts where they lay at a 45 degree angle so the label is displayed. 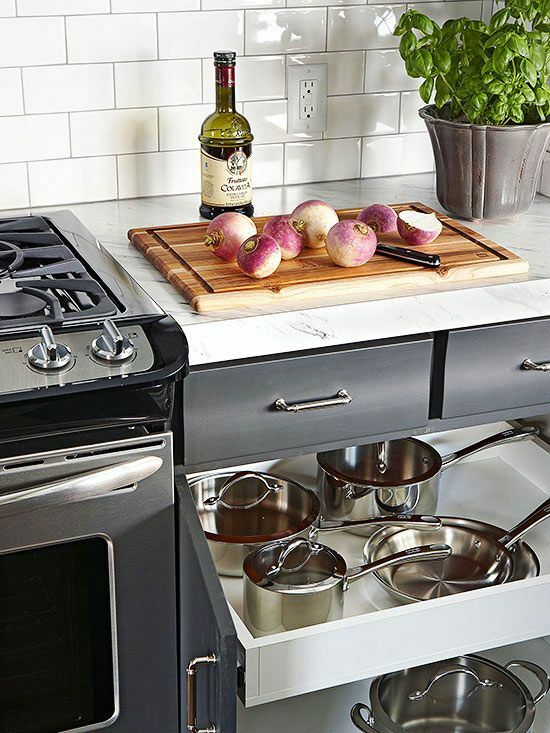 The one benefit to storing your spices in a pull out like the below is the shelves can be made to fit things like olive oil that are also nice to have next to your stove. It may seem like a nice to have for the kitchen and I would have agreed until we got our water happy cat, Luc. Right now managing the water bowl so it doesn't get knocked over and played in every day is a thing. I love this idea both for making the water bowl something he can't knock over easily or as a way to hid the pet bowls so they don't have to sit out all of the time. This is a part of the range + microwave or stove-top + microwave/oven combo debacle. 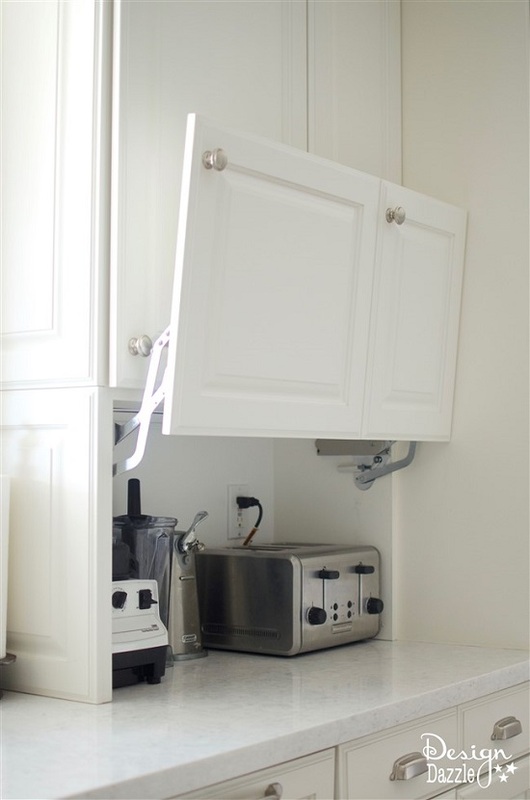 I have not totally decided here but I like the idea of a pull out drawer microwave. We don't use ours a ton (and haven't had one in our house since we moved in two years ago), but the drawer functionality seems nice for items you heat, stir and heat again. 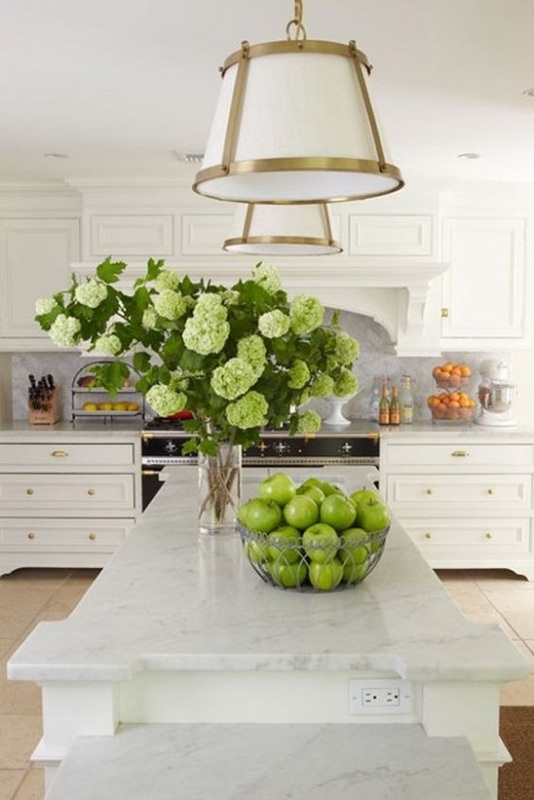 A trick to kitchen functionality is to keep things off the counter. What I love about this idea is they can say on the counter, but they are out of sight. A plus if you can have an outlet in here to make the storage functioning when you need it to be. The toaster is easy to use you just have to plug it in and remember to unplug it when you're done. Our house won't have a walk in pantry so this feels like the next best option. The pull out shelves make it much easier to see what you have. 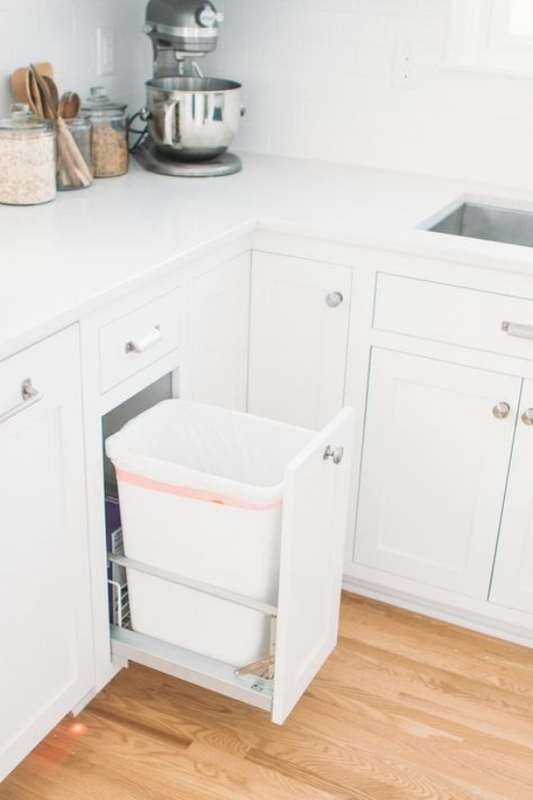 A must in our house I like to have both a concealed trash and recycling container for design, smell and the environment. I like the organization idea to keep your sharpest knifes in a safe place. 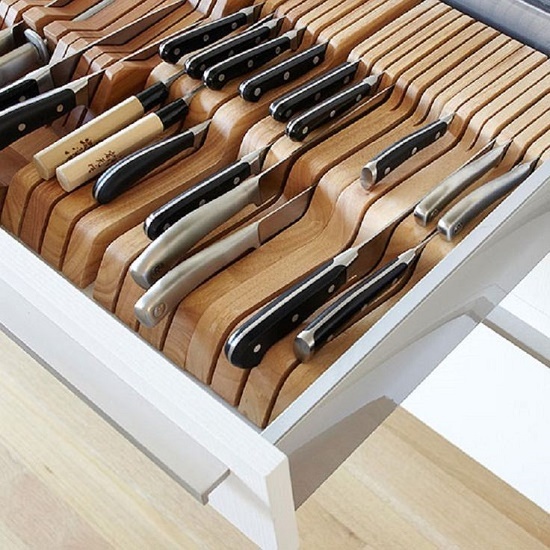 The drawer doesn't have to be this big, but clears up counterspace by not having them in a knife block. I am not a big fan of corner cabinets. 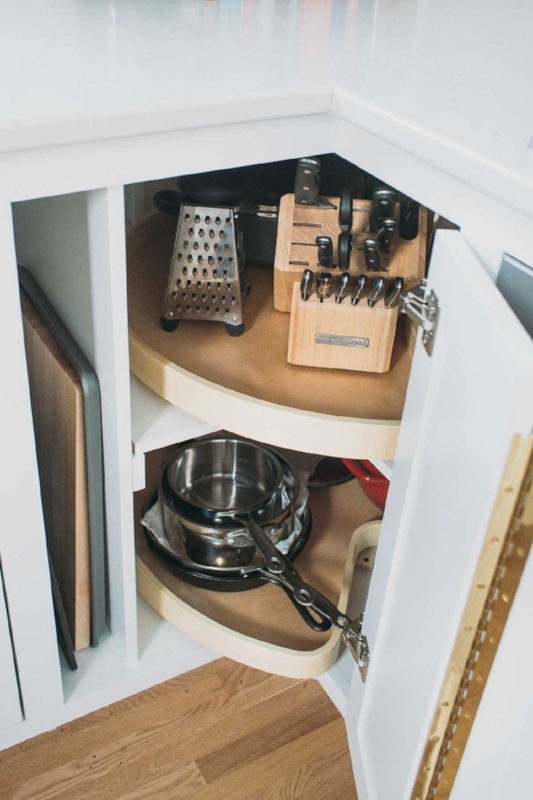 I find them hard to get into, but a lazy susan or shelves that has a hinge so it can pull all the way out are my favorite options to take advantage of this space. 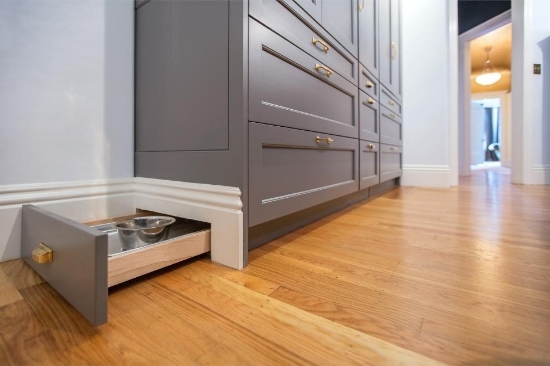 Last but not least this idea I found as a solve to have a place for brooms and pet food in our kitchen. 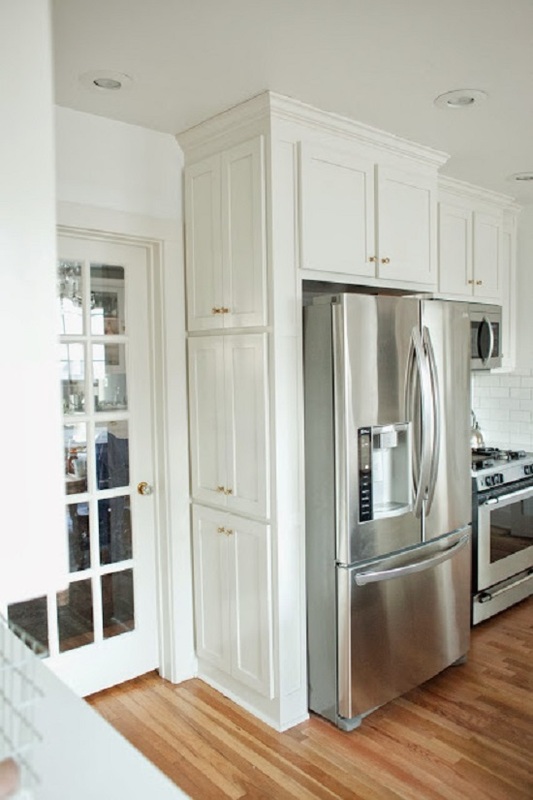 I like the idea of using a piece of the built in fridge for additional storage. 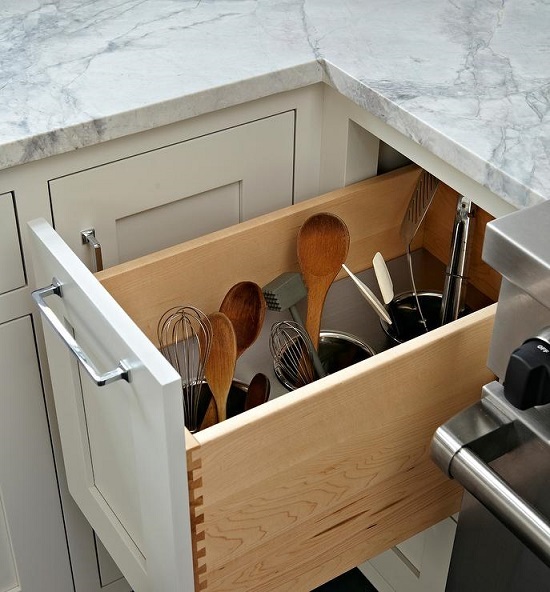 A custom drawer insert for taller utensils to save counterspace.